An adult-sized pre-moistened washcloth that is strong enough for personal cleansing but gentle on pipes** in the event of accidental flushing. 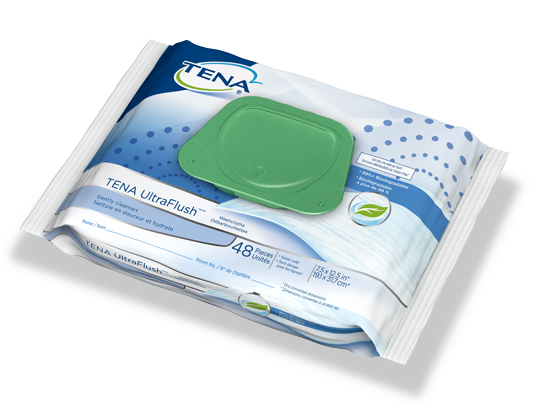 TENA UltraFlush™ Washcloths are designed to soothe fragile elderly skin. Gently cleanse and moisturize leaving skin feeling soft and smooth. Support toileting programs as well as resident independence and dignity. One-handed dispensing with a closable plastic lid. Mildly scented, dermatologically tested, alcohol free and enriched with aloe, chamomile and vitamin E to soothe delicate elderly skin. *It is recommended that all disposable washcloths are thrown away in the garbage. If disposing into a system connected to municipal sewer, only one wipe should be flushed at a time. Flushable in properly maintained, code-approved toilets and sewers. Not approved for septic use. 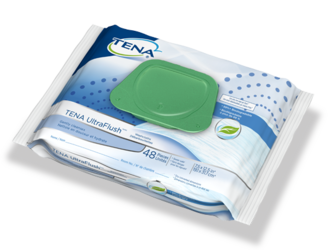 Not all systems can accept flushable wipes. Do not flush if: RV or marine system; grease or fat disposal share drain pipe; any history of slow flow or clogs; system includes macerator toilet or household pump; advised by system operator; or unsure of system capability. If problems develop, stop use immediately. Failure to follow instructions may result in clogs and/or property damage.